/ / / / / GDSH digital s.r.o. You can be anyone you want. We’re an agency that gives you a memorable face in the digital world. Invisibility is not our cup of tea. In visibility we trust. Therefore, we make websites with memorable digital experience. From institutional to creative websites. We help clients expand to mobile universe where they can reach hearts of customers. Brands have personalities that deserve well fitting suit. Corporate identity is fun but our work is not a joke. NGO projects are necessary and inspirational. We help build their websites, apps, brand and raise awareness. You want too? Call us now. We’re honored to make pretty things for wonderful clients and believe you’ll be one of them. No time for chitchat? Get to the point as quickly as possible, just fill in the form so we have a clear idea what are you after. A lot of wonderful projects starts with non binding chat with good coffee. Come and meet us. For a staffing agency that offers a completely new business model, we’ve developed a site with scrolling animation that simply explains the principle of the service provided. Předvýběr is an HR service that delivers suitable job candidates for companies with specific needs. Predvyber differs from other companies by their way of focusing on candidates and making sure their customers get only the top picks. In highly competitive HR market, only a few companies can compete with unique services that bring high added value to customers. In order to establish a market position, it was necessary to set a uniform visual style that corresponds to corporate communication. We were happy to be able to help Predvyber with this task by creating a new logo and defining the new corporate identity so the company is perceived more confident. As the first step, we came up with a logo redesign. The new logo was incorporated into all levels of corporate communication, from presentations, business cards to online presence. The client followed our recommendations of consistent usage of the logo in all company communications thus creating brand awareness that will only strengthen over time. We simplified shapes, got rid of excess decorative elements and chose new typography. Pure lines and simplicity provide lightness to the brand that represents credibility and professionalism of a young modern company. The result ensured an integrated and cohesive marketing approach company wide. The new logo was made with all the possible usages in mind. To make sure the company can use the branding in a way it was intended we created whole logo manual as well. We defined logos use on materials with monochromatic printing or inverted backgrounds, defined unique brand colours for screens as well as print materials and brand fonts. 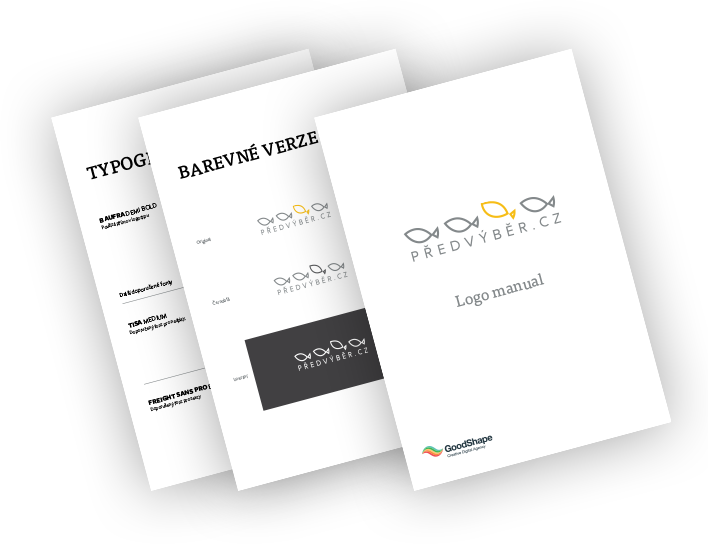 New corporate identity of Předvýběr came along with upgrading online presentation that matches the modern face of the company. We explained the principle of innovative services to potential customers with original graphics, making it clear what is the added value of collaboration with Předvýběr. It is important in HR industry, as in any other, to have a personal contact and to be able to get attention. We created business card design in vertical format which is a bit uncommon and thus making the company stand out another bit more. Presentation of our business has become modern and ranks us among top HR companies. The new form of our visual side has helped us to be recognizable for customers and to establish our position on the market. Don't just take a our word for the information above. Take a look how does the project looks and works yourself. Refreshing brands is time to time necessary to catch the wind in sails. Do you want to know more?